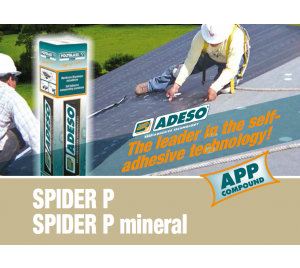 SPIDER P and SPIDER P MINERAL are top-quality prefabricated self-adhesive bitumen membranes made using ADESO® technology, the new compound laminating system developed by Polyglass SpA. SPIDER P and SPIDER P MINERAL are made with an plastomeric (APP) compound and have a polyester staple-fibre nonwoven carrier reinforced and stabilized with glass strands parallel to the machine direction. 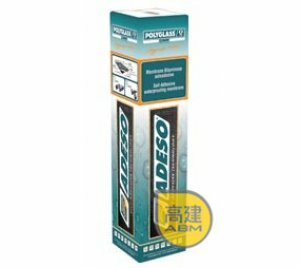 This carrier gives the product excellent dimensional stability, top mechanical performance and good on-site workability. 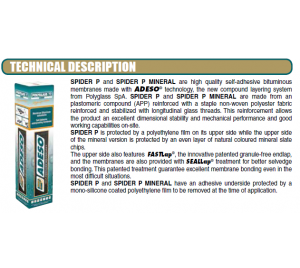 The SPIDER P membrane's upper face is protected by a polyethylene film, while the MINERAL (granule surfaced) version is faced with an even layer of natural slate chippings. In addition to the innovative FASTLap® (registered patent) selvedge on the end of the roll, the topside of the membranes also features SEALLap® treatment, namely an adhesive strip applied to the upper face of the selvedge. 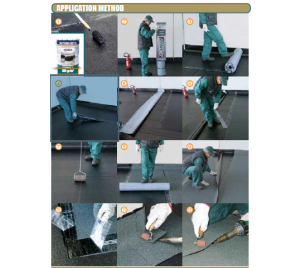 This treatment (registered patent) guarantees excellent membrane adhesion, even in the most demanding situations. SPIDER P and SPIDER P MINERAL are protected on their adhesive underside with a mono-silicone coated polyethylene backing film to be peeled off as the membrane is laid. 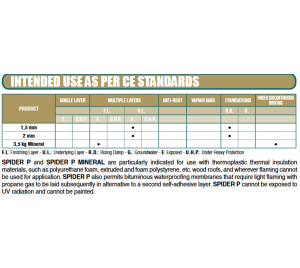 The SPIDER P and SPIDER P MINERAL membranes are produced to the quality standards set by NAT® technology the innovative manufacturing system for the control of polymer matrix ageing in bituminous membranes.